How are boat graphics different from other vehicle graphics? Boat Wrap vs. Vehicle Wrap – What’s the difference? Last week we discussed 4 bullet points for boat owners who were considering graphics for their boat. 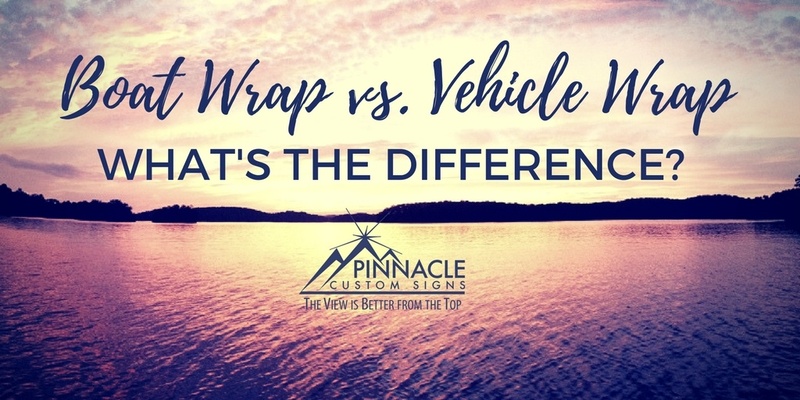 Now we are discussing the differences between a boat wrap and vehicle wrap. From the materials, tools and even the way you clean the surface, there are several nuances that make it important to find an experienced, professional installer. Here are some of the finer details of the actual process behind a boat wrap that is crucial for getting a quality wrap job. Finding accurate boat design templates to base a wrap design on is difficult. We often have to custom create layouts for each boat. The challenges of designing a boat are a lot different than utilizing a vehicle wrap template. 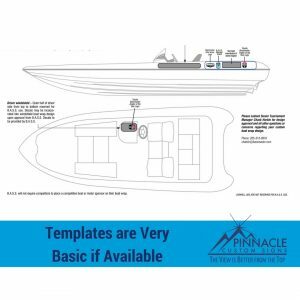 The availability of industry standard templates from the various boat manufacturers for various models is not as prevalent as with vehicles. In addition, boats typically have a lot more curves than most cars or trucks. Both the front of the boat and the side of the boat simultaneously curve which presents challenges during the design phase because of the additional angles. The team at Pinnacle has to keep in mind the focal design elements of the wrap during installation. Important elements of the design are usually incorporated on the lower part of the boat so that they don’t lose perspective. Pinnacle’s certified installer Trent Marshall pointed out that installation is tricky because “if you start taping the design in the back and then pull it to the front, it can stretch or skew the front graphics and lose perspective.” It is really helpful if this is addressed during the design stage of the boat graphic by making sure your branding or name are added to the lower half of the design itself. Vinyl graphics are often applied in sections to make installation easier and more accurate. When applying vinyl on a boat, you have to consider the end result and how the water and wind will interact with the seams. Taping up the design to the boat is next step of the process to ensure that the approved design truly fits the flow of the boat. Since we generally don’t design boat wraps with templates, it is critical to make sure the measurements for the graphics are accurate. The taping process helps us make sure that the wrap fits before we start the application process. Deciding which area to start the process of applying the wrap is critical to how the design will appear when it’s complete. 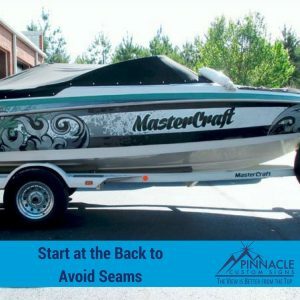 Since you want as few seams as possible, Pinnacle typically starts at the back of the boat in order to try to ensure that the seams or overlaps are flowing with the wind and not against it when the boat is on water. “We try to avoid having overlapping seams on the sides that would increase the chances of water hitting the seam and pulling the vinyl,” says Marshall. The back of the boat also has some indentations that typically takes an experienced installer to apply the vinyl correctly and can usually be handled easier by someone who is more experienced with those challenges. Once you’ve applied the vinyl properly, the longevity of the wrap all depends on the wear and tear on the boat. However, you can potentially extend the life of the wrap by laminating it. 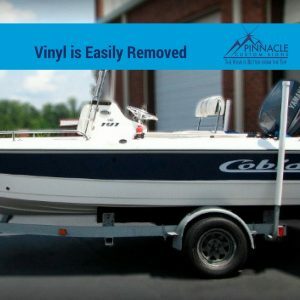 Laminating a boat wrap with laminate manufactured by the same company that manufactured the vinyl can create a longer lasting effect for your graphics and help with the beating the boat takes from sunlight, water, and rubbing up against docks or other boats. Boat wraps have a greater possibility of wear and tear than vehicle graphics simply because of all the elements they endure. Whether you are into recreational boating or competition fishing, you can easily change the look of your boat from year to year. Swapping Out Vinyl Wraps Is Easy! The good news is that vinyl can be removed fairly easily if it was installed properly. The majority of the boat graphics that Pinnacle installs are located in the southeast. Because the climate is warmer in these states, it is usually fairly easy to peel the wrap away from the boat while ensuring the quality and safety of the paint underneath. In the case where you are trying to remove the graphics during colder weather, our team can use a heat gun to assist in the removal process. So now that you understand why all graphics aren’t created equal, you can see why it is important to find a team of installers who have experience with boat graphics to design and install your wrap. We know that you have invested a lot of love, time, and passion into your favorite home away from home. We want you to be satisfied with the way your boat looks on the trailer and on the lake. So, make sure that when you select a company to wrap your boat, you ask about their experience with boat wraps to make sure your design and installation process is successful. For questions about boat wraps, vehicle wraps, or pretty much anything with an engine — give us a call and we can discuss options within your budget and how we can help! You are here: Home / Vehicle Graphics / Boat Wrap vs. Vehicle Wrap – What’s the difference?